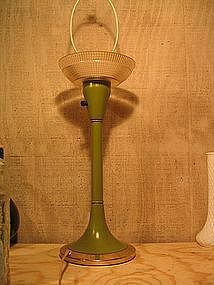 Vintage Tyndale lamp measuring approximately 23 inches in height. Several scratches to the finish, slight wear to the gold tone band on the base. It is working order, but any older lamp should be checked out for safety. I need your zip code to calculate the postage.